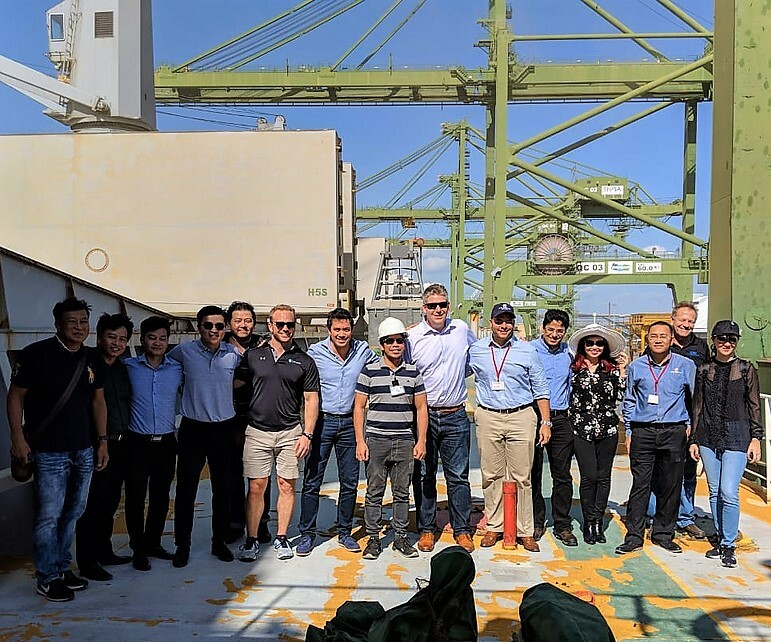 USGC Regional Director for Southeast Asia Manuel Sanchez and USGC Vietnam Country Representative Tran Trong Nghia witnessed the first bulk shipment of distiller's dried grains with solubles (DDGS) under new fumigation protocols as it was discharged in January. U.S. Grains Council (USGC) Regional Director for Southeast Asia Manuel Sanchez and Vietnam Country Representative Tran Trong Nghia traveled to a port two hours outside Ho Chi Mihn City last month to witness the discharge of the first bulk vessel of U.S. distiller’s dried grains with solubles (DDGS) sold to the country under fumigation protocol agreed upon in 2017. Bulk vessels can hold much higher quantities of DDGS than container vessels, so the event marks a positive evolution for imports of DDGS from the United States. This is an important moment for Vietnam and the U.S. grain market because, as the market matures, the country is showing it is committed to utilizing U.S. DDGS in greater quantities. When the original suspension of DDGS imports occurred in 2016, the Council immediately went to work with both the U.S. Department of Agriculture’s Animal and Plant Health Inspection Service (APHIS) and the Office of the U.S. Trade Representative (USTR) to find a solution and keep the market open for U.S. products. A new fumigation protocol was agreed to by the two countries in 2017. The success of a bulk vessel of DDGS arriving under the protocol highlights the impact of U.S. industry partnering with USDA and APHIS to keep markets opened for U.S. exporters as well as the importance of having staff members in local markets who can react quickly and coordinate outreach on the ground. In 2017/2018, Vietnamese imports of U.S. DDGS more than doubled year-over-year to 1.05 million metric tons, setting a record for DDGS sales in the country, and placing Vietnam as the fourth largest importer of U.S. DDGS for the year. While there, Sanchez was also able to capture video of the ship-to-shore transfer of the DDGS, available at the Council’s pages on Instagram, Facebook or Flickr. Read more about the Council’s work in Vietnam.